Across the street from the main entrance of Wilfrid Laurier University there is a small parkette with a modern, albeit modest memorial to Canadian veterans. The parkette also includes several information panels outlining the history of the surrounding neighbourhood that is now known locally as Veterans’ Green. The surrounding townhomes and 1½ storey bungalows that surround this monument were Waterloo’s first major veterans’ settlement after the Second World War. My current research examines the development of this neighbourhood in the context of Canadian post-war veterans’ policies and the reconstitution of the Canadian family. back to its longtime residents. Years of redevelopment to accommodate Wilfrid Laurier’s growing student population had raised concerns amongst many residents that the humble and close-knit character of the neighbourhood had been lost, along with its historical significance as a post-war community. Indeed, Veterans’ Green was one of the first major housing projects in all of post-war Waterloo County. It remains a physical reminder of the return to ‘civvy street’ that so many veterans looked forward to upon discharge. Although the parkette and monument have been important in reminding students and community members of the neighbourhood’s value as a heritage site, today the original character of the neighbourhood has largely been lost due to residential development. Many of the cottage style 1½ storey homes are currently being modified or torn down to pave way for new student apartments and very few original residents remain. It was the speed at which the community was changing when I attended Wilfrid Laurier from 2005-2009 that compelled me to pursue this project as I moved on to my Master’s at the University of Waterloo. “‘Home Sweet Home’: Veterans’ Housing in Waterloo, Ontario, 1945-1960” is a two-part project that examines both the development of national post-war housing policy and Waterloo’s Veterans’ Green community. It relies on a variety of different sources ranging from government publications to local newspaper articles. Of particular interest are the records of the Veterans’ Green heritage project, which Karen VandenBrink at the City of Waterloo Museum has graciously allowed me access to. This collection contains a great deal of valuable material on the families that settled in the neighbourhood after the war, including videos and transcripts of oral interviews with a number of former and existing residents that were carried out in 2004. The material available does indeed show that a strong sense of community emerged between residents during the first years of the neighbourhood’s existence. Residents maintained a local skating rink, had games nights, and looked after each other’s children when there was an illness. Family histories, oral testimonies and even photographs of the neighbourhood also provide a detailed window into life in a suburban community at the height of the post-war baby-boom. After all, Canadian veterans were eager to begin family life and return to ‘normalcy’. As historians such as Doug Owram have suggested, the war had a profound effect on shaping this idea of ‘normalcy’, and in particular the emphasis on marriage, having children, and building a suitable home. The Veterans’ Green community was no exception. In fact, some residents called it ‘incubator hill’ because of the number of children. One of the other striking features of Veterans’ Green that I have explored in my research is the working-class nature of the community. According to Vernon’s Directory, the majority of residents in the neighbourhood had post-war careers in Kitchener-Waterloo’s manufacturing sectors, or became clerks in the city’s burgeoning insurance industry. The class dynamics of the community are of interest because, although money was tight in many families (especially those with 6, 7, and even 8 children), veterans that settled in the area were able to rent and even purchase housing much quicker than non-veterans in similar socio-economic positions. 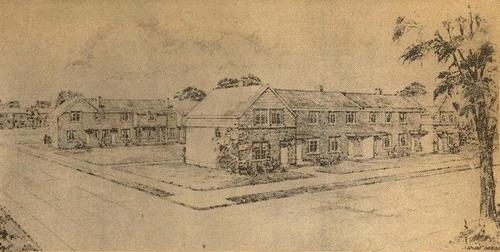 Affordable housing was both a means to return to normalcy, but also a reward for service, enshrined in the collective body of legislation known as the Veterans Charter and facilitated through government crown corporations like Wartime Housing Limited and Central Mortgage and Housing Corporation. From a heritage standpoint, the work already completed by the City of Waterloo has been invaluable in shedding light on the veterans who settled in the community and what motivated them to move to the neighbourhood. Much of this information remains available online on the Veterans’ Green webpage for public use, and I would encourage those interested to browse through the family histories that have been collected. My hope is that the research I am currently undertaking will bridge the gap between history and heritage by extending an analysis of veterans’ housing in Waterloo to include the importance of family life, the role of class and citizenship, and the lived experience of post-war housing programs. Mona Gleason, Normalizing the Ideal: Psychology, Schooling and the Family in Postwar Canada (Toronto: University of Toronto Press, 1999). Jeffrey Keshen, Saints, Sinners, and Soldiers: Canada’s Second World War (Vancouver: University of British Columbia Press, 2004). Peter Neary and J.L. Granatstein, The Veterans’ Charter and Post-World War II Canada (Montreal: McGill-Queen’s University Press, 1998). Doug Owram, Born at the Right Time: A History of the Baby Boom Generation (Toronto: University of Toronto Press, 1996). Sean Purdy, “’It was tough on everybody’: Low-Income Families and Housing Hardship in Post-World War II Toronto,” Journal of Social History 37, no. 2 (Winter 2003): 457-482. Kellen Kurschinski is currently finishing his MA at the University of Waterloo and is headed to McMaster University in the fall to start his PhD.